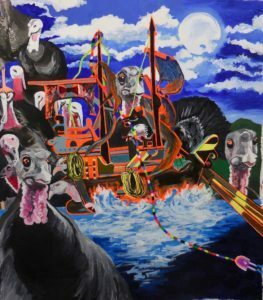 SHIP OF FOOLS, acrylic on canvas, 48" x 36"
Surreal painting about the USA at the present moment in time. Irene Dogmatic actively started her career as an artist in 1972. She has lived and worked between San Francisco, New York, and Berkeley. Being both a visual and performance artist in SF in the early 1980s, she was active in the Punk Scene with her bands The Beautykillers and the Kahunas plus SST. Travel writing and poetry are a constant as is Correspondence Art which she became involved in during the 70s. Her first solo show at Pro Arts, Project Space opens on December 7 through January 3, 2019. The work Ship of Fools is a very angry piece but is also meant to be funny. As an American slang, a turkey can either mean a clueless person or a play that is a flop. The Ship of Fools is a very old metaphor that may have originated with Socrates and has been used in literature and art throughout history and more recently has been used in popular music as well. A punk group called Reno Divorce even did an entire album called Ship of Fools. It has both a political and sexual context, depending on which musician is using it. The artist utilizes it metaphorically to show that how people in power can change and impact our lives.